WHEN 16-year-old Melissa Leavy started suffering headaches and blurred vision, she didn’t think anything was wrong. But after the teenager – aged just 12 at the time – was taken to the optician by mum Theresa in February 2012, damage to one of her optic nerves was found. he discovery led to the devastating diagnosis of relapsing remitting multiple sclerosis (RRMS) – a lifelong neurological condition. MS is a condition affecting the central nervous system, as the coating around nerve fibres called myelin is damaged. This causes symptoms including vision problems, difficulties with balance and dizziness and severe fatigue. People with RRMS have distinct attacks of symptoms which then fade away either partially or completely. Affecting around 100,000 people in the UK, MS is usually diagnosed when a patient is in their 20s or 30s – but Melissa is one of just five to ten per cent of sufferers diagnosed under the age of 16. "I was devastated, absolutely traumatised. I wish it was me, and not her, I wish I could take it away from her"
Melissa, who lives in Downpatrick, Northern Ireland, told The Sun Online: “I could make myself see double. “So if there was a car in front of us and there was the number plate I could see two of the number plate, but I thought I was able to make myself see it. And then my dad saw [something wrong with] my eye. After her optician immediately referred her to the neurology department at Belfast’s Royal Victoria Hospital, Melissa spent an entire weekend undergoing tests as doctors battled to find out what was wrong. When she received the diagnosis, the youngster didn’t know anything about MS – and was banned from researching anywhere except the MS Society and MS Trust, as her devastated parents, Theresa, 35, and Martin, 38, fought to protect her from inaccurate information. But even when doctors assured her she was one of the most important patients on the ward, brave Melissa insisted she just wanted to get on with it, asking to do homework and even offering her hospital bed for children she believed were more sick than her. Theresa said: “She always is worrying about everybody else. [In hospital] Melissa said, ‘I could go home and you could just let somebody else have this bed’. She added: “Because the paediatrics weren’t familiar with the condition, they asked us to send Melissa’s reports to a children’s specialist in Birmingham before they would give us a definite diagnosis of MS, which came then when we went back a couple of months later for a review. “I have a condition that I had brain surgery for 12 years ago, so initially I thought ‘it’s neurological, is it my fault’? “They said no, it’s one of those things, they don’t know what causes MS so don’t think like that. “I was devastated, absolutely traumatised. I wish it was me, and not her, I wish I could take it away from her. Now, Melissa – who kept her MS a secret from most of her friends, until one day revealing it in a class discussion about discrimination – suffers headaches, dizziness, vomiting, pain from lesions in her spinal cord, and crippling fatigue. The symptoms worsen when she’s under a lot of stress – such as during exam periods at school. She explained: “I told my best friend, but I didn’t tell anyone else. She was just like ‘oh my god, what can I do to help you?’. “Some mornings I wake up, and I’m tired and I have a sore head, but then there’s other mornings I wake up and I’m fine. And then I feel tired and I trail my leg, or I’ll limp. In the first 18 months, Melissa suffered six aggressive relapses – even breaking her foot after dizziness caused by MS resulted in a fall. 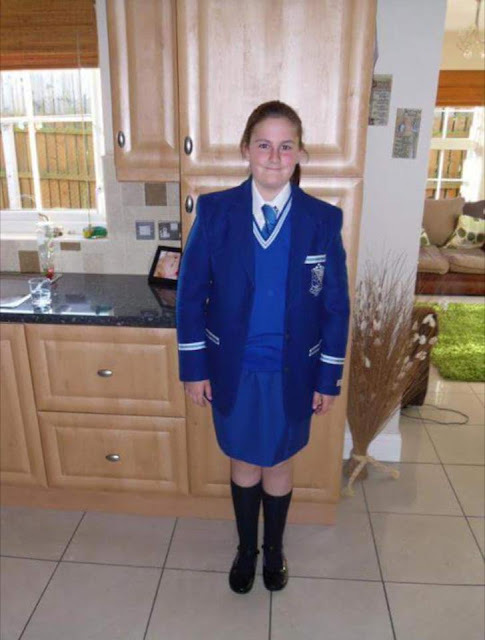 But despite Theresa, who is on the MS Society’s Northern Ireland council, injecting her once a week with a disease modifying therapy, the treatment did not seem to work – with the effects of MS causing Melissa to miss around 225 days of school in total. As a result, doctors decided to try a high-risk infusion treatment, which has a one in 10,000 chance of causing brain damage and permanent disability. It worked brilliantly – but the risk increases to just one in 100 if a certain virus is present in the patient. So, after testing positive for the virus in March, Melissa will now be moved to a drug called Lemtrada, which doctors hope will keep her well. Theresa explained: “It’s trial and error with these things, you can’t assume anything that’s MS-related. “None of these treatments are actually licensed for anybody under 18, so there’s the difficulty of even getting them signed off for her. “Lemtrada is the next port of call. It’ll be some time next year but it means that she’s going to be off treatment for potentially three to six months and that means that the MS could strike as aggressively as it did for the first two years. There is a risk that Melissa could miss even more school – but since her diagnosis, staff at her school in Ballynahinch have received specialist training to support Year 12 pupil Melissa. At first, while her friends rallied round her in support, teachers struggled to understand the severity of Melissa’s MS – thanks to its often invisible effects. But now, Melissa is helped by a dedicated classroom assistant to take notes when she is absent, a taxi to reduce fatigue and an iPad to replace heavy textbooks. Theresa said: “It’s been very hard because MS is an invisible illness, they can’t see the pain so it’s very difficult for them to understand what she’s going through. “I had struggled getting the support that she needed, because there’s very few children with MS in Northern Ireland so they’re not geared for it. When she isn’t busy studying for six GCSE subjects, music-mad Melissa, who won the MS Society’s Young Person of the Year award two years ago, is dedicated to fundraising for research into a cure – which she hopes will be available by the time she’s 35. So far, her efforts have raised an incredible £15,000 for the MS Society. She said: “We’ve done a couple of coffee mornings in my sister’s primary school, my mum did the fire walk and the zip-line, and my granddad and uncle did the zip-line too. “My mum also did nails for her friends and they put a donation in. We raised £200 doing the nails. She added: “I’m just trying to be positive. “I’ve met a few people through the MS Society and they’ve been really sick and then got better with different treatments. So I just think I’m going to be like that. Meanwhile, mum Theresa added: “Generally, we try and be really positive. We’ll always say thank goodness we live in the north of Ireland and not the south because she’d have to pay for her healthcare. “Yes, it’s horrible being diagnosed at 12, I wouldn’t wish it on anybody, but she’s potentially diagnosed 10 years earlier than the normal range. “So she’s had 10 years of being on a preventative treatment before she would’ve, as the rule of thumb, been diagnosed. Imogen Scott Plummer, the MS Society’s Head of Care & Services Research, said: “MS can be a really unpredictable condition to live with and symptoms like fatigue can have a huge impact on a young person’s life, making things like school and studying even more challenging than normal.